It is that time of the year again — time for the Academy’s Annual Meeting! This year the City of Lakes will host the eighty-second annual meeting of the Academy from 4 to 6 November. 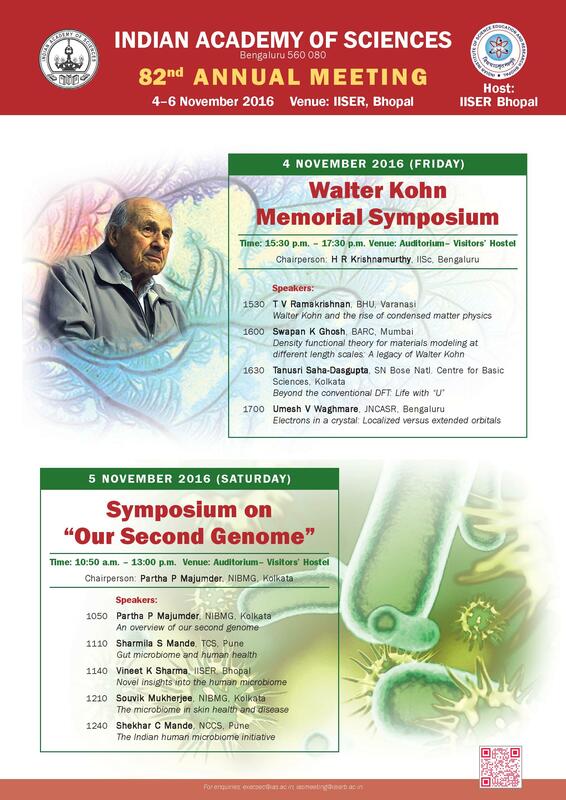 This year’s highlights are the symposia in honour of Prof. Walter Kohn and on “Our Second Genome”. Walter Kohn played a prominent role in the evolution of condensed matter physics from obscurity to its present prominence. The talks in this symposium will range from Kohn’s contributions to the field, to the density functional theory (DFT) of Kohn, and beyond. Only about 10% of cells associated with a human body are human cells; the remaining 90% are cells of microorganisms. This microbial community (called microbiome) is therefore expected to have huge influence on our health and well-being. The understanding of the relationship of “our second genome” with that of our own genome is just beginning to emerge. The effect of this second genome on human health will be discussed in several talks. The public lectures are always on timely topics, and what could be more relevant than Rajendra Singh’s talk on indigenous water management systems? Rajendra Singh is a well-known water conservationist from Alwar district, Rajasthan. He is known as the “waterman of India”. The Guardian named him among its list of “50 people who could save the planet”. He runs an NGO called Tarun Bharat Sangh (TBS), which was founded in 1975. TBS has been instrumental in fighting slow bureaucracy and mining lobbies, and has helped villagers take charge of water management in their semi-arid area close to Thar Desert, through the use of johad, rainwater storage tanks, check dams and other time-tested as well as path-breaking techniques. Starting from a single village in 1985, over the years TBS helped build over 8,600 johads and other water conservation structures to collect rainwater for the dry seasons, has brought water back to over 1,000 villages and revived five rivers in Rajasthan. 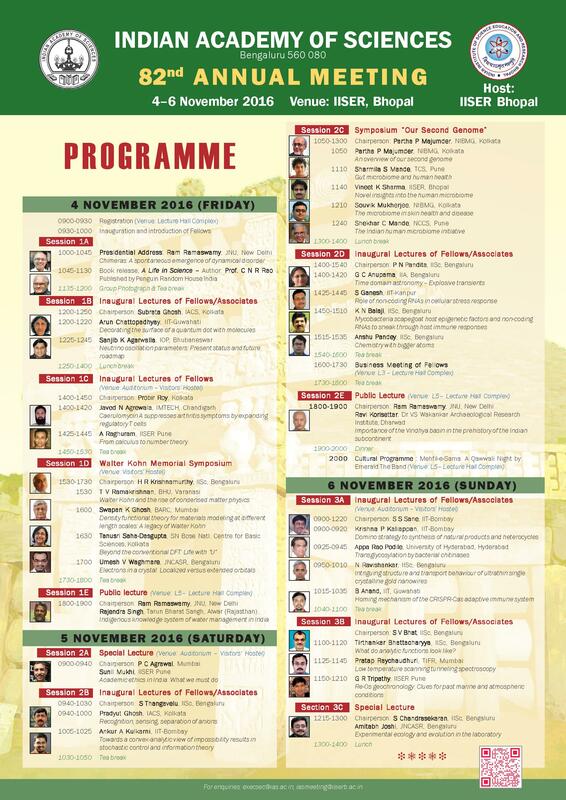 The other public lecture is by none other than historian and archaeologist, Ravindra Korisettar. The Indian subcontinent has witnessed two major phases of human expansion out of Africa during the Pleistocene (during the last 2 million years). Not only the timing of Homo sapiens expansion into the subcontinent but also the intra-subcontinental expansion needs to be placed in geo-environmental perspective to be able to arrive at definite picture of the role of regional geographical environments within the subcontinent that may have played a pivotal in the expansion process within and without the subcontinent. The Vindhya Basin preserves the highest density of Palaeolithic settlements as well as evidence for continuity of human occupation throughout the Pleistocene. He will focus on the nature of evidence from this region and also from the related regions to emphasise the need for multidisciplinary investigation at select sites while highlighting the achievements of Palaeolithic research and our understanding of cultural evolution during the Pleistocene. 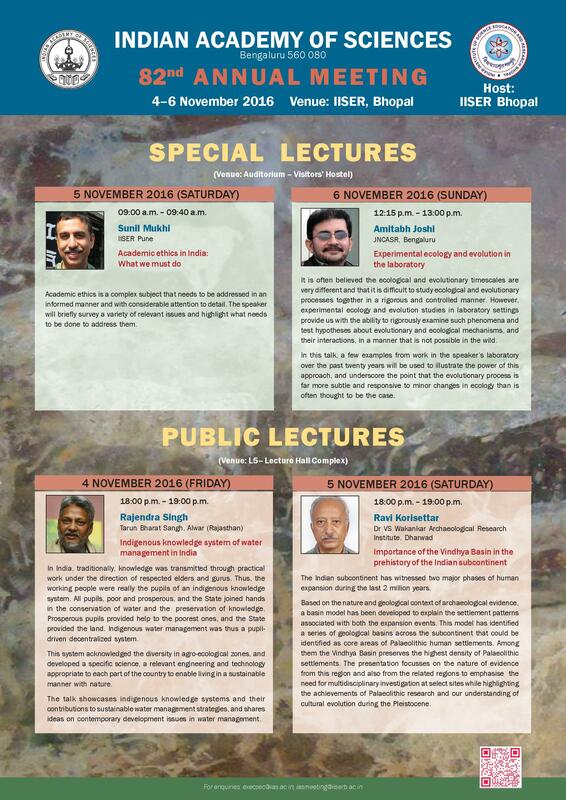 Special lectures this time are on academic ethics in India and on experimental ecology and evolution studies in laboratory settings. 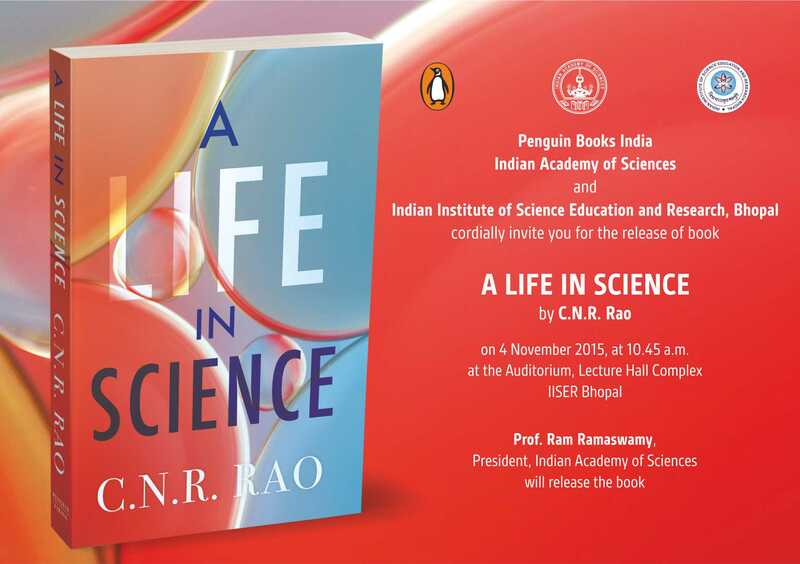 This year we have another special event: Dr CNR Roa’s book “A Life in Science”, published by Penguin India will be released on 4 Nov by Prof Ram Ramaswamy, President, IASc. Join us on 4–6 November 2016, at IISER Bhopal! For updates follow us on Twitter.